The effect is that both players shuffle their hand into their deck and draw 4 cards. 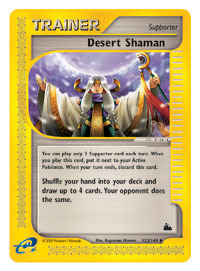 I thought that this was a new effect, but it is a similar effect of an older card called Desert Shaman from Skyridge (with each player drawing UP to four cards), and the crew reviewed it once way back in 2002. When it first came out, it saw a good amount of play due to being a Supporter card that does both hand refresh and disruption. When you have cards in your hand that you can’t make use of, Judge can help you get out of a tight spot, and it doesn’t even discard your cards. For the disruption aspect, there may be a chance where you may help or hinder your opponent due to the nature of randomness when it comes to physically shuffling decks properly. Probably the best opportunity to disrupt your opponent, assuming that you don’t care about your hand, is when your opponent just searched cards from their deck onto their hand while simultaneously ending their turn. Steven’s Resolve and Sylveon-GX’s Magical Ribbon are examples of being foiled by a disruption card. Of course, cards tend to compete with others during the time Judge was legal. 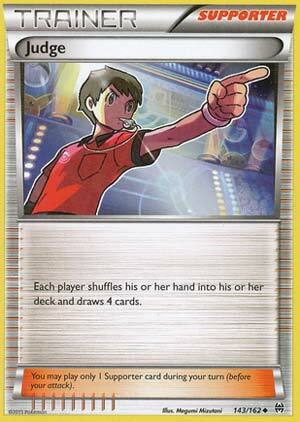 For hand refresher, Professor Oak’s New Theory and Cynthia nets you six cards. N also nets you more or less cards than Judge depending on when it was used on that part of the match. N could be better early game and worse for late game when both players are down to few prize cards. As for hand disruption? Again, N could do a better or worse job than Judge, but for the opposite reasons compared to the first aspect. N could be worse due to being down to one card, but Judge still nets you four cards. Ace Trainer also does a better job if you’re behind on prizes. You net six cards while your opponent gets three. Wicke is situational since it relies on the quantity of both player’s current hand. Judge was also seen on decks that have a strategy of keeping a certain hand size to trigger additional effects. This is evident on appearing in certain World Championship decks in 2011 and one deck in 2016. 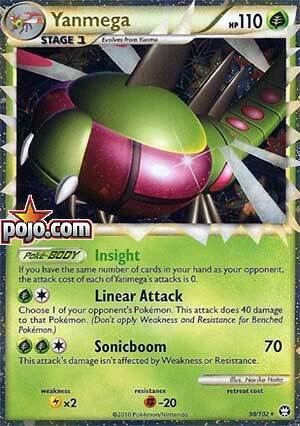 Those decks tend to feature Yanmega, both the Prime and Break Evolution. For Yanmega Prime, it was in an archetype called MegaZone where it was partnered with Magnezone Prime for even more draw power in case Judge is unavailable. Yanmega’s Poke Body Insight states that if you have the same number of cards as your opponent, the attack cost of this Pokémon is free. The attacks that it had was Linear Attack which did 40 damage to one of your opponent’s Pokemon and Sonicboom that does 70 damage but didn’t apply Weakness or Resistance. The 2016 Worlds deck was called Bebe deck and it also had a Yanmega card whose ability is similar to its predecessor. Sonic Vision states if you have 4 cards in your hand, then Yanmega’s attacks are free to use. This time, it’s only attack, Assault Boom, did 50 damage plus 70 more of the Defending Pokemon has a Pokemon Tool attached to it. And Barrier Break does 100 damage whatsoever and didn’t apply Weakness and Resistance just like SonicBoom does. Both Yanmega cards weren’t too powerful, but it does enough to 2HKO the majority of the game in their respective times. It was fortunate that Judge had other applications that made it appear on couple of World Championship Decks, because Judge would’ve been outclassed if players didn’t think outside of the box. Just seeing it appear on several decks makes me happy enough to give it a above-average score on certain formats. Standard has less competition in regards to what Judge does, but Expanded and Legacy has both N and Professors that schools most Supporter cards. Despite that, it was used in a specific deck that reaps the benefits of having a certain hand size to ignore energy costs. Having attacks that are free to use will mean that Max Potion has no liability and energy punishing users won’t hit you too hard. In Limited, if you pulled one, you’ll run this. Given that you might have a large hand filled with mostly redundant cards, by using Judge, you might keep yourself from decking out, prolonging the match.